The mornings were misty most days. I was up early, before the skipper “tickled the kitty,” generating the loud purr that fired the lights aboard the Tongass Ranger. It was a time to capture the last remembered details of the previous day, before they too became part of the mist. By 5:30, the bright aurora of the sun glowed through the fog, and hints of blue-gray sky could be imagined. Jake, our skipper and cook, wandered down to the galley from the pilothouse, where he slept, and started the coffee. Slowly the forecastle and the aft cabin came to life. The aroma of bacon filled the boat, drawing the volunteers to breakfast. Another day was underway. The Kosciusko Island Kayaks and Rock Art project provided a variety of opportunities for PIT volunteers to contribute to our knowledge of the region’s prehistory, enhance their own understanding of the natural and cultural history of southeastern Alaska, and walk and paddle along the shores experiencing the place firsthand. The first adventure was getting to the project area. While most of the crew boarded the 65-foot FS work vessel, the Tongass Ranger, for the 6-hour cruise north across the Bay of Esquibel and Sea Otter Sound, three folks made the journey by a more sheltered route, in an open, 17-foot runabout. The weather turned rainy that first day, and the beautiful ride north was exhilarating, shall we say, for the volunteers in the runabout. For the next five days, the crew alternated between several tasks. George Poetschat and Carolynne Merrell led the rock-art-recording contingent. Beginning at a known petroglyph location, the crew surveyed the beaches looking for additional petroglyphs. New sites were defined and mapped. Each petroglyph was described and documented in various ways. Sketches were made of all p e t ro g l y p h s , and digital photos were taken. Most panels were traced on clear plastic sheeting. 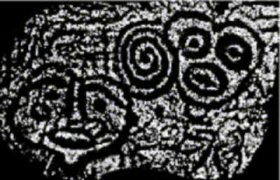 For selected petroglyphs, where it was determined negative impacts would be minimal and where the character of the design element lent itself to the technique, rubbings were done, sometimes on rice paper, sometimes on light canvas. We spent most of five days at site 49-PET-029, the principal subject of our investigations. 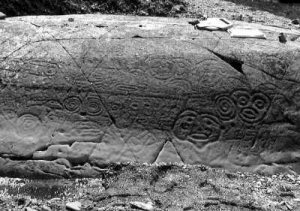 A 30- foot-long boulder at the site is covered on both sides and top with designs intricately etched into the rock; distinct images often overlie faded, presumably older work. Perhaps the most challenging aspect of this experience was to focus on the same rock for five days, struggling at times just to see the patterns. Then, after sitting all morning in the subdued lighting and misty rain, a sunbeam would shoot through a hole in the clouds and light up the panel. The images leapt out of the rock! The mind would reel at the visual impact of the experience. Suddenly, designs that hadn’t been visible the moment before were perfectly clear. Realizing that this experience would last only as long as the hole in the clouds, the scene came to life. Everyone grabbed their cameras and captured the moment. In the five days at the site, conditions were never the same. Each change of lighting, moisture, and mood brought a new way of seeing the images and new possibilities of understanding what was seen. 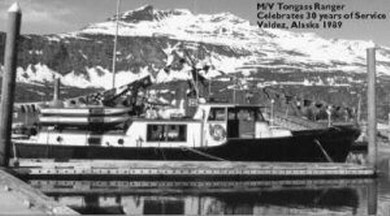 In the weeks before our trip to Kosciusko Island, Yarrow Vaara, a student at the University of Alaska Southeast and a native of the nearby Tlingit village of Klawock, interviewed elders in the communities of Klawock, Kake, and Ketchikan. Yarrow joined the crew in the field and shared with us many of the insights and thoughts the elders had offered. The specific meaning of these designs was not remembered, but the elders knew stories of life in the camps and summer villages that had once been nearby. They knew legends of mythological happenings that might tie in, things to keep in mind as we did our work. While half the crew recorded petroglyphs, the other half searched the shores and forests of the bay for other evidence of past activities. Survey was conducted by sea kayak, landing at all suitable beaches, carefully looking for evidence of human presence, and probing for buried material. 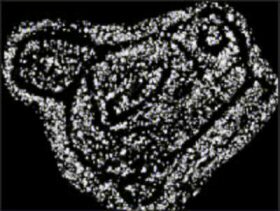 The crew located a second petroglyph site, reported but mislocated by a 1939 mapping crew. They also found two small shell middens, which likely mark the locations of seasonal camps. 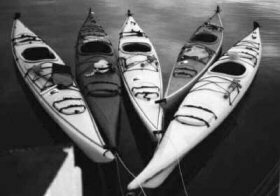 Kayak-based survey is an excellent way to locate archaeological sites associated with modern shorelines and to experience a physical connection with the natural setting. Spending a few days searching for good places to camp heightens the appreciation of life in the coastal rainforest. On our last full day in the field, we moved toward El Capitan Passage and stopped to examine 49-PET-017, a petroglyph site well known to travelers of the Inside Passage. It was a sunny day, and the petroglyphs, quite different in style and form from those at 49-PET-029, were easy to spot. We spent the afternoon sketching and taking photographs and gradually migrating through Dry Pass to our final camp at El Capitan. Friday evening, we lounged around a campfire talking to Kevin Casey, a FS cave guide who has been leading visitors underground at El Capitan Cave on Northern Prince of Wales Island for three years. On Saturday morning he led us up the 300+ steps to the cave entrance and in past the iron bat gate that protects the fragile cave formations from potential vandalism. We passed a passage, 600 feet back in the cave, where people had left two obsidian projectile points and some charred cordage over 3,000 years ago. 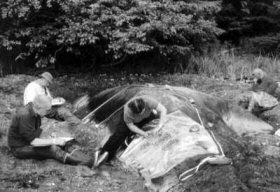 We heard about Dr. Tim Heaton’s 1992 excavations of a huge, 12,000-year-old brown bear skeleton from another passage. We walked and crawled and slid our way to a point where passages diverged vertically, diagonally, and horizontally in all directions. And then we ran out of time. As we emerged onto the hillside above El Capitan Passage we could hear the first of our two floatplanes landing to take us back to Craig, 75 miles to the south. We hurried to get ready, bundle our things into their containers, and load the planes. By early afternoon, everyone was on his or her way home. It started to rain again, and we hardly noticed.